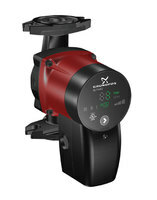 The Grundfos ALPHA will change the way you view circulators. With its permanent magnet motor design, this energy efficient circulator reduces power consumption by 50% or more. The unique patented AUTOadapt™ feature controls pump performance automatically within defined performance range, ensuring lowest possible energy consumption without sacrificing comfort. 99163903 Alpha2 15-55F Cast Iron Circulator Pump with Terminal Box for conduit connection applications.